The Envantage Middle Distillates Analyzer is a turn-key system that provides group-type separation of aromatic hydrocarbons and non-aromatic hydrocarbons in diesel fuel and petroleum distillates boiling in the range of 150 to 400°C. The method provides compositional information for three group-types: mono-aromatic, di-aromatic, and tri+ aromatic hydrocarbons. The analyzer meets the precision and quality control specifications established in the ASTM D6591-11 (and the equivalent IP548-06) standard test method. Fatty acid methyl esters (FAMEs), if present in diesel fuel and petroleum distillates boiling in the range of 150 to 400°C, can interfere with the determination of tri+ aromatics using the ASTM D6591-11 (and the equivalent IP548-06) standard test method. 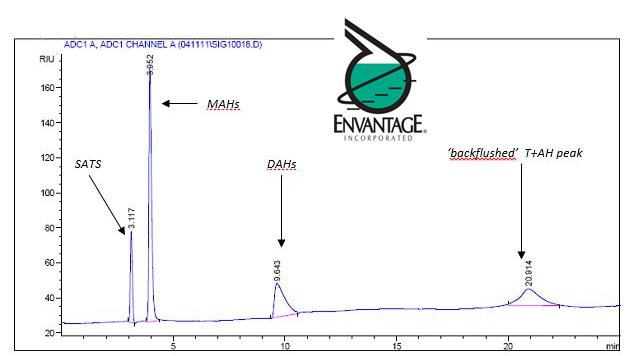 The Envantage Middle Distillates Analyzer can be modified in accordance with The European Standard (EI) IP391/07 to separate saturates, mono-, di-, tri+, aromatic group types in petrodiesel and petrodiesel/biodiesel blends containing fatty acid methyl esters (FAMEs) (up to 5 % (v/v)) with improved accuracy of large PAH molecules without interference from FAMEs.